Spray tanning entails the application of tanning solution, often comprising of DiHydroxyAcetone (DHA), under pressure on human skin. To be able to do this effectively and safely, you will need to invest in the best professional spray tan machine. For many users, this choice is already proving to be a difficult one. Basically, the right tanning equipment will depend on the intended application and the much you are willing to spend (Source). However, you will still need to choose the right type of machine that versatile enough for your tanning projects. Are you having a problem choosing the best spray tan machine? Not anymore, here are reviews of five top rated professional spray tan machines. 7.1 1. HVLP or LVLP? As you will learn later in this guide, High Volume Low Pressure (HVLP) spray tan machines are some of the best for professionals. 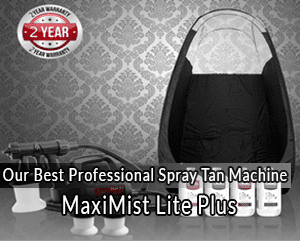 One of the bets HVLP machines you can buy today is the MaxiMist Lite plus Spray Tanning system. This may not be the best commercial tanning machine available today, but is a great choice for users looking for a mobile or lightweight salon tanning machine. The product is packed with all the features you would need for professional quality tanning results. To begin with, the unit is powered by a single stage 300 watts turbine. This system is designed to deliver 47 cfm of air flow. Despite being a powerful model, you will find this product relatively quiet in operation. In this regard, the product is rated 75 DB. Most of the users who have purchased this product before are not only satisfied with its impeccable performance, they also find it easier to use. With regards to versatility, the product offers several customizable features. For instance, the product is equipped with several adjustment controls next to the trigger. These controls will help you regulate such aspects as the spray pattern. The adjustability of this unit is further enhanced by its German engineered spray nozzle. Such features combine to offer you the best professional finish for each tanning project you undertake. If you are looking for the perfect blend of beauty, elegance and performance in your new spray tan machine, this will be a great choice. Like most of its users today, you will be drawn to the Fascination FX Spray Tanning machine by its stunning aesthetics. In this regard, the product features an ergonomic design with silver trim accents and bold contours. The unit is equipped with an ergonomic handle that you will find organically formed into the machine. This makes the product easier to handle, hence reducing the fatigue associated with spray tanning. In addition to its appealing aesthetics, you will also love the performance of this product. The model is equipped with a single-button control turbine that is powerful enough for an array of tanning applications. In this regard, the product has been proven to deliver a consistent and reliable airflow for tanning. While this is the case, the product is rather quiet in operation. This may be attributed to its unique sound baffling mechanism. In order to reduce noise production by the machine, the manufacture has included a sound dampening enclosure on the outer shell of this product. The intake of air in this spray tan machine takes place at its rear end. This has been proven to reduce the intake of spray tanning overspray considerably. 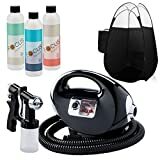 Users who have experience with spray tan machines will tell you that it pays to buy your machine from a reputable brand. Over the years, Novell has proven itself to be one of the leading manufacturers of tanning equipment. 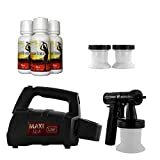 The Novell M-1000 Salon Mobile Sprat Tanning Kit by this manufacturer is one of the best professional tanning equipment you can buy today. In addition to a quality, high-performance spray tan machine, you will also get a floor fan, tent as well as a promotion packet with every purchase of the unit. The product is a great choice for salon owners looking for quality and portable tanning equipment. 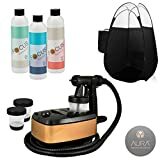 Right form a compact and lightweight design to a customizable performance, the Aura Allure Spray Tan Machine Kit is designed to meet your requirements. Like the other products reviewed in this guide, this unit has many likable features to offer. To begin with, the product uses Satin Spray Nozzle Technology. This technology is aimed at providing the best atomization of the solution for the best coverage. The powerful turbine motor used in the machine is quiet and reliable for moderate to more demanding applications. You will also love the fact that the product allows you to customize several aspects. In this regard, it features a solution dial that is designed to offer you 0 to 2 fl oz of solution control. The design of this unit is another aspect you will love about it. In addition to being lightweight, the product is also compact and rather feminine. This makes it portable and relatively easy to store. The machine features cable management, which is the very first of its kind in the market. When it comes to spray tan machines, portability is a key consideration. Your preferred model should be compact in design, lightweight, yet powerful enough to deliver professional quality finish. The Fuji Mini Tan M model 2100 is one of the best products, in this regard. As a matter of fact, it is one of the most powerful mini tan machines in the market today. For enhanced durability, the product features a metal body and several stainless steel fluid components. With this model, you will also be able to adjust the flow and several other aspects for perfect results. in this regard, it features an adjustable pattern knob. Provided that it is done correctly, spray tanning is considered to be one of the safest as well as fastest tanning methods in use today. One problem though, the results you get will, to a considerable extend, depend on the equipment you are using for the process. It goes without saying, the best spray tanning machine will give you the best results. Easier said than done; choosing the right spray tan machine from the hundreds of makes and models available today can be a daunting task. This will particularly be a problem if you do not what to look for in the equipment. HVLP refers to High Volume Low Pressure spray tan machines while LVLP refers to the Low Volume Low Pressure Units. So, which of the two types is ideal for your tanning requirements? Well, this will depend partly on the much you are willing to spend on the equipment. In this regard, most of the LVLP tan machines are known to be cheaper than most HVLP spray tan machines available today. Other than the cost consideration, you will also realize that each of the two spray tan machine types has its own set of benefits and downsides. The HVLP machines, for instance, are known to waste less tanning solution and are less likely to overheat, as compared to the LVLP machines. The LVLP units, on the other hand, operate at a comparatively lower pressure. As a result, you will find the various LVLP spray tan machine relatively hard to use. As a result, they may not be the right choice for beginners. Additionally, most LVLP are known to be noisier and may lead to more wastage of the tanning solution. Whether you are a beginner or a professional in the field, you need to understand that not all the tanning projects you will undertake will be the same. As such, you should consider buying a spray tan machine that is a bit customizable. The leading brands in the industry today are varied when it comes to adjustability. 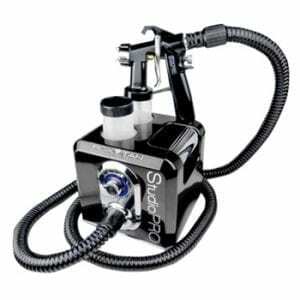 Variable Speed Settings – depending on the complexity of the project, you may need to adjust the speed of the spray tan machine. With variable speed setting controls on your machine, you will be able to regulate the speed of airflow produced by the unit, hence achieve the right solution/air ratio. Heat Option – the sensation of cold tanning solution against the skin can be unbearable for some clients, especially in winter. In such scenarios, a spray tan machine with a heat option will come in handy. When activated, the heat option allows the machine to produce warm instead of cold air. Overspray can be a painful waste of both time and tanning solution for any professional. Not only does this make your work messy, it requires you to continually clean it up. To minimize this problem, it is advisable to go for the tanning equipment with features to reduce overspray. This will also make it easier for you to deliver professional quality results with every tanning project. While this may depend on your preferences, you will definitely need a machine that is relatively easy to use. An ergonomic handle on these units has been proven to minimize the fatigue associated with handling these machines. Additionally, it helps to buy a machine that is comparatively lightweight and portable. Just as is the case with other spray tanning products, buying the best spray tan machine is not an easy decision. Whether you are working on a limited budget or not, there are a few things you need to consider when shopping for the right model. With all the helpful information included in this guide, choosing the best professional spray tan machine should now be easy.